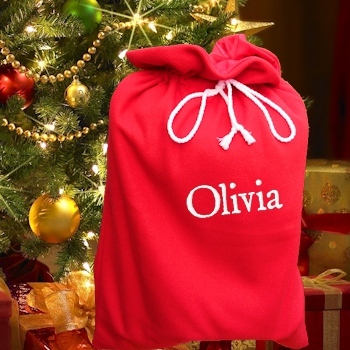 Personalised Large Christmas Santa Sack in festive red fleece complete with a white rope drawstring top. Personalised Large Christmas Santa Sack in festive red fleece complete with a white rope drawstring top. Perfect for those expecting a bumper Christmas delivery from Santa this year, a good size sack to hold all of those lovely gifts.